A government official said Tuesday the seven-page report accuses Prime Minister Recep Tayyip Erdoğan of inflaming Turkish public opinion against Israel with his repeated allegations that Israel committed war crimes during its Gaza offensive last winter, according to a report by The Associated Press. The official spoke on condition of anonymity because the report is confidential. He said the report also acknowledged Deputy Foreign Minister Danny Ayalon seriously offended Turkey's ambassador when he summoned the diplomat to protest a Turkish TV show that portrayed Israeli intelligence agents as cruel. Still, it said that the incident made clear that Turkey "reached the outer limits of the Israeli government's patience." The report came as Turkey stated Tuesday that it would pursue its determination against anti-Semitism, racism, xenophobia and discrimination with its belief in mutual understanding, tolerance, freedom, security and democracy. 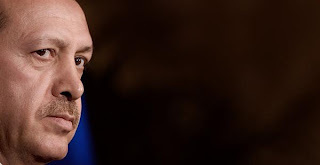 In Israel, Foreign Minister Avigdor Lieberman and Ayalon, both of Yisrael Beiteinu, are the leaders of the government's aggressive anti-Turkey faction, while Defense Minister Ehud Barak and Industry Minister Benjamin Ben-Eliezer, both of Labor, head the conciliatory, pro-Turkey faction. The report was written by the Center for Political Research, which performs the ministry's in-house intelligence analysis, and has already been distributed to Israeli embassies and consulates abroad. It was submitted to the key seven cabinet ministers a few days ago, Israel’s Haaretz reported. Regarding Ayalon's humiliation of Ambassador Oğuz Çelikkol, the report said that while this seriously offended the Turks for many years to come, “at the same time, the manner in which senior Turkish officials, including Erdoğan, ended the crisis may indicate that Turkey recognizes that it entered the red-line zone and [reached] the outer limits of the Israeli government's patience, and that this was liable to lead to it losing Israel, which would damage Turkey's international legitimacy." But most of the report focuses on the Turkish prime minister, who it considers the main source of the current friction. “In our estimate, ever since his party took power, Erdoğan has conducted an ongoing process of ... fashioning a negative view of Israel in Turkish public opinion,” via endless talk of Palestinian suffering, repeatedly accusing Israel of war crimes and even “anti-Semitic expressions and incitement,” it said. Though in international forums Erdoğan always stresses that anti-Semitism is “a crime against humanity," the report continued, in reality, he “indirectly incites and encourages” anti-Semitism in Turkey. "For Erdoğan and some of those around him," it explained, "there is no distinction between 'Israeli' and 'Jewish,' and therefore, [their] anti-Israel fervor and criticism became anti-Jewish." One result, according to the report, is articles in the Turkish press questioning whether Turkish Jews are loyal to their country – something that could endanger Turkey's Jewish community. In some cases, it added, Erdoğan simply does not understand the anti-Semitic nature of his remarks – such as "Jews are good with money," which "he sees as a compliment." While charges of anti-Semitism levelled by Israeli leaders against those critical of Israel are quite common, some of those made by the report have also been echoed in the Turkish liberal press and among intellectuals. While accusing Erdogan of anti-Semitism is quite bold, it does seem that the prime minister has a bizarre understanding of Judaism and Israel. Yigal Schleifer gives one illuminating example from last January when Erdogan alluded to an obscure Jewish saxophonist and anti-Semite named Gilad Atzmon. For more on the AKP response to the wave of anti-Semitism that struck Turkey following Israeli war crimes in Gaza, see Emrullah Uslu's analysis from last January. Also see post-Gaza post from last February, in addition to my post on some Washington neoconservatives' targeting of Turkey and some of the pieces of the puzzle its exponents conveniently leave out. CLARIFICATION (1/27) -- The analysis from Emrullah Uslu that I linked here contains a factual error. Uslu cites Article 312 as a speech law in Turkey's penal code that has traditionally been used to punish hate speech. While this was the case prior to April 2005, in September 2004 Turkey adopted a new penal code. This penal code basically replaced Article 312 (offense and incitement to religious or racial hatred) with Article 216 (inciting hatred or hostility). I had missed this, and thanks to Bulent for pointing it out. The major missing link in the government's preventive measures is the implementation of the articles in the penal law that prohibit racism. Erdogan has made his strong opposition to anti-Semitism clear on several occasions, and Article 312 in the Turkish Penal Law prohibits "Instigating a part of the people of a different religion or sect to hatred or hostility against another part of the people" (Turkish Penal Law, Article 312). The European Commission against Racism and Intolerance (ECRI) has determined, however, that the implementation of Article 312 is usually used against separatist or radical Islamist movements. Only a few people have been prosecuted for anti-Semitic and racist remarks toward minorities. The ECRI reported that although anti-Semitic and racist statements had been made publicly, including in the media, Article 312 had not used against those making such remarks (ECRI Third Report on Turkey, Adopted on June 25 2004). A singer was recently prosecuted for his racist remarks against Armenians (www.bianet.org, November 7, 2007); but as of yet, no prosecution of the neo-nationalist and radical Islamist newspapers that circulate anti-Semitic remarks has been reported. It would be a reassuring step if the Justice Minister urged prosecutors at least to investigate anti-Semitic remarks in the media. Oh yes, I wholeheartedly agree, more speech investigations and prosecutions are direly needed. In fact we ought to clear whatever nonsense we feel like uttering with the government and get a licence to say it. This, as we all know, is "the major missing link" between the present awful state of affairs and bliss. This would have been OK if it were labeled 'racist' or somesuch but as it is, it indicates a wholesale adoption of Western-style anti-anti-Semitic thinking which probably won't fit the Turkish ways. It is stereotyping a race for sure, though, and in that sense it is racist (and I would have no problem if people opposed it and the politicians refrained from it on that basis). BTW, that approach would also technically render Ahmet Altan an anti-Semite since he tries to mention admiration of Jewish ingenuity that many angry critics of Israel supposedly have as evidence of their not being anti-Semites. Again, this is racist in the sense that it implies some racial basis for this 'ingenuity' but isn't anti-Semitic in any sense I'd like to see adopted in Turkey. It is possible that I am misunderstanding things, though. Am I? For things like anti-Semitism, it might be a good idea to keep in mind that circumstances have moved/forced marginal people many of whom have been genuine anti-Semites into the center and the attitudes in the 'center' are not neutral but themselves have discriminatory and cagetorically (in some odd 'secular' sense) anti-gavur undertones. You cannot get a good sense of this unless you read stuff in Turkish. More often than not, even people who produce prose in both languages tend to take a different tone in Turkish if not say outright contradictory things. This isn't necessarily/entirely due to hypocrisy either. As in the case of anti-Semitic language, people tend to avoid certain patterns when using English due to having -- unwittingly -- absorbed the effects of (the not altogether respectable) fear of getting stuck with an undesirable label. "Jews are good with money" sounds the same to a Turkish ear (when uttered in Turkish) as, say, any other widespread belief about any other of the local peoples like "Armenians are good with music" and people see nothing wrong with it.